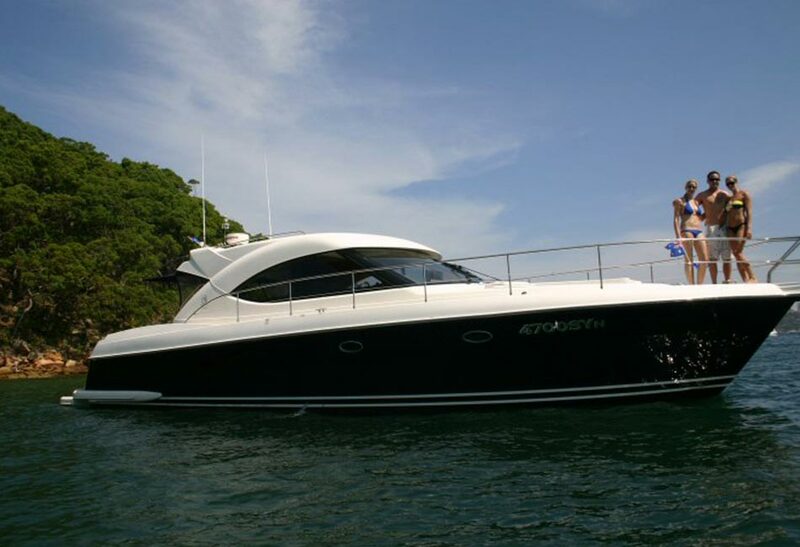 This Riviera 4700 offers a luxurious indoor area complete with large leather lounge, 360 views with the year-round comfort of climate control air conditioning. The indoor area opens onto a large entertaining deck featuring a 12 seat hydraulic dining table with room for seating for all passengers. Alternatively it can be configured for standing room, ideal for cocktails and finger foods. 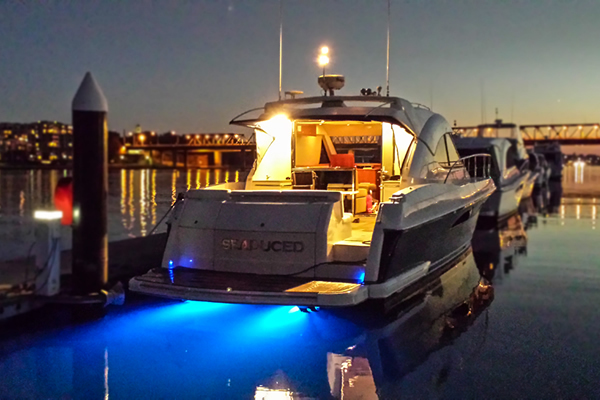 No matter what your event, occasion or requirements, SEADUCED offers complete flexibility. 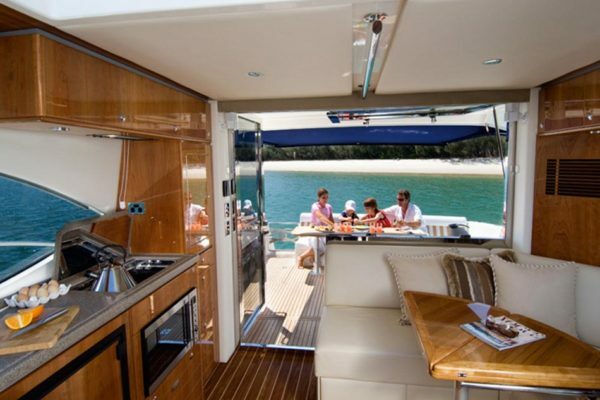 SEADUCED offers all the comforts of home, three bedrooms and two bathrooms. The master bedroom can be closed off and has its own private ensuite, ideal for romantic getaways and overnight stays. The two bathrooms feature glass hand basins, frameless shower screens and of course hot and cold running water. After a dip in the harbour, an outdoor shower is available for a quick rinse down including 240 volt power for accessories such as hair-dryers, straighteners etc should the need arise. All cabins and rooms are of course fully air conditioned. Featuring the latest LED Flatscreen TVs in every room, including a hydraulic lift 26″ in the main saloon. We have DVD & iPad / iPhone facilities onboard with HDMI connections available for external equipment (e.g. laptop presentations). Music for any occasion is provided by a custom installed BOSE sound system featuring 5.1 digital surround sound in the main cabin. 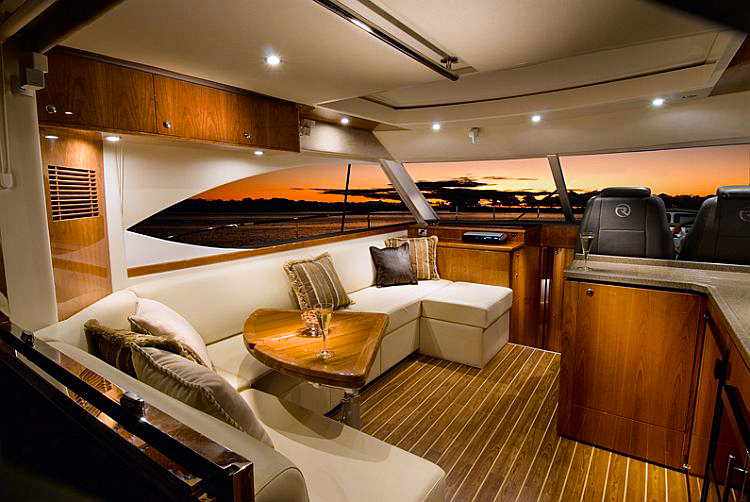 Outdoor speakers are linked in to bring the party to the outside of the boat. BBQs, Oven, Microwave, Cooktop, Bath Towels, Hand Towels, Use of Eskys, Fridges and Supply of Ice. BYO Food & Drinks Service. Drop-o at Woolloomooloo (No Charge), Storage and 30 minute window pickup of leftovers ($50 per 48hrs – no loss liability accepted). take up to 22 on application. Please request a quote for groups 13 or more. Skipper and 1 Wait staff included. For larger groups (16 or more) we do recommend an additional staff member @ $50.00/hr. For pick-ups and drop-offs outside the City and Eastern Suburbs, 1/2hr travel time will apply. Standard Timeslots. Quoted rates for day charges between 9am and 5pm or evening charter between 6pm and 12pm. All other times subject to approval and rate variation. Three Hour Minimum O-Peak, Four Hour Minimum Shoulder & Peak unless approved by operator. Our free pickup/drop o zone is between Drummoyne Ferry Wharf and Rose Bay Ferry Wharf, additional travel time charged for pickups or drop offs past these points. Quoted price includes 4hrs cruising time 6pm to 10pm. 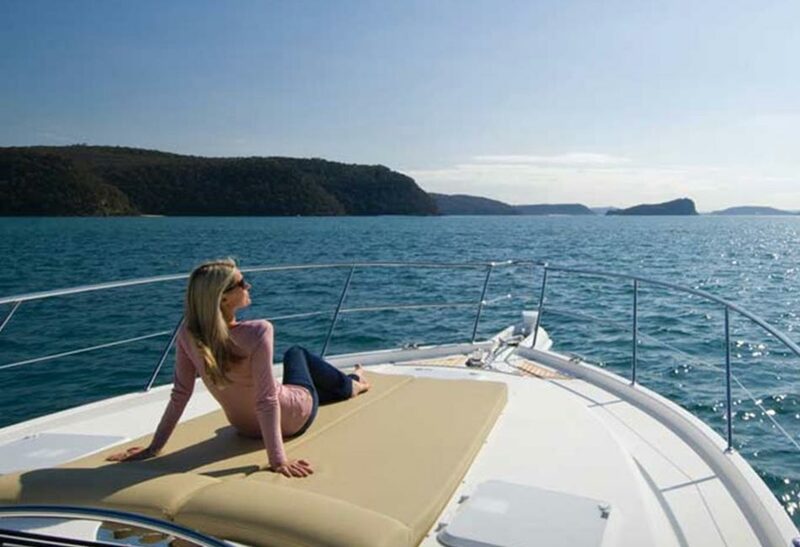 Overnight berthing fees vary depending on location. 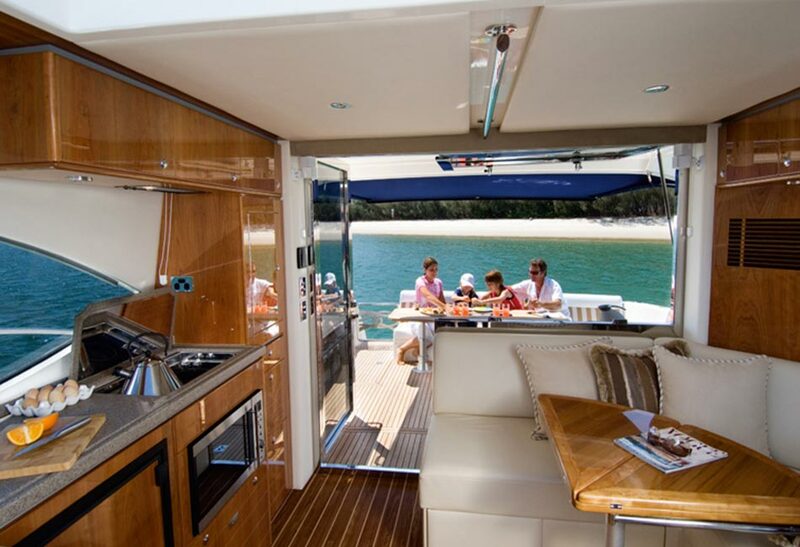 Amenities Fee Inclusions Use of Premium Champagne Flutes, Wine Glasses, Drinking Glasses, Cuttery, Dinner Plates, Side Plates, Dessert Bowls, Serving Platters, Serviettes, BBQs, Oven, Microwave, Cooktop, Bath Towels, Hand Towels, Use of Eskys, Fridges and Supply of Ice. Smoking only whilst stationary in designated area, otherwise $200 cleaning fee. Above normal spillages, vommitting, unremoved decorations, shoe marks etc $200. Any damage to vessel will be charged at rate to repair to previous undamaged condition. Standard $2,000 per charter cleared funds / $3,000 overnight charters. Behavior / Conduct. Charters provided on the condition that guests follow crew instructions. Failure to follow instructions, high levels of intoxication or abuse of staff/ guests will result in termination of charter, no refund will be payable. Salmon Fillet slow cooked with grapefruit and kale salad. Cumin Sweet Potato with Fetta, Pickled Onions & Spinach Leaf Salad. Fresh from the sea, Crystal Bay prawns, Coffin Bay oysters, sashimi of salmon, BBQ Octopus, smoked salmon. Fresh from the sea, Crystal Bay prawns, Coffin Bay oysters, sashimi of tuna & salmon, king fish ceviche, BBQ Octopus, Bugs or lobster. Side salad of Watermelon, Rocket & fetta. Garden salad with tomato & cucumber. Platters must be ordered with other main course menu items, or subject to $400 minimum order. Desert and Starter platters are entrée or desert sized portions and should not be considered as meal sized.